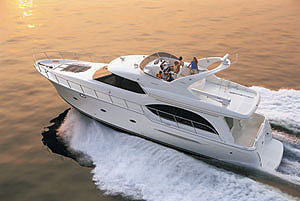 Offshore 80 Voyager: Go long-range cruising in comfort and style. The 80 Voyager's main deck has an abundance of space for entertaining — inside, outside or partway between. The term "mega-yacht" is often used to refer to boats larger than 80 feet in length. Here's where you'll find the true meaning of luxury on the water. The Offshore 80 Voyager stands at the entry to this stratified realm. It has space enough for the accoutrements of elegant cruising yet in a size that enables it to go places larger vessels would have difficulty navigating. The 80 Voyager is a semi-custom design, meaning the basic deck plan and fittings are pre-determined by the builder. 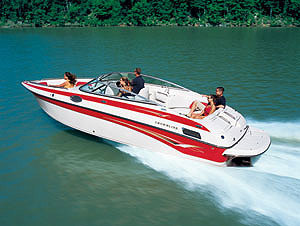 The boat is sold with few options — and almost everything you'll want is standard equipment. The customization comes in the interior decor, where choices are to be made in fabrics, flooring and — most important — cabinetry and woodwork. The boat we were aboard had been designed with rich teak throughout the interior. The darkness of the wood was countered by a wonderfully balanced use of lighter colors in upholstery and window treatments. Other areas where custom choices are required include electronics, both at the helm and throughout the cabins. 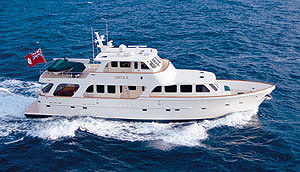 And if you want the "ultimate" option, Offshore Yachts also builds the Voyager in an 87 foot version. A 7 foot cockpit can be added to the stern below the boat's California Deck. The Voyager is arranged on three levels. The lowest contains a pair of guest staterooms that are accessible via a forward staircase on the main deck. Each has an en suite head with a stall shower. The owner's suite is amidships and is reached by its own staircase. It has a king-size berth, an entertainment center with audio and video gear, plus countertops along each side and a mirrored vanity. The master head extends nearly the full beam of the boat along the forward bulkhead of the master suite — and offers "his and hers" entrances on either side. They open to separate toilet and sink compartments, each of which adjoins a shared shower compartment. Offshore includes another useful feature in the owner's stateroom. Located adjacent to the air conditioning control next to the berth is a B & G Network repeater that displays key data from the helm station. Ever get up in the middle of the night and wonder what the wind speed is or whether you're dragging anchor into the shallows? Now, you can know at a glance. The engine compartment is abaft the sleeping quarters. On boats this size, mechanical space is not an issue. The pair of 800 hp Caterpillar 3406E diesels installed on our test boat had walk-around room on all sides, not to mention headroom to spare for my 6 foot, 4 inch frame. Here, you'll find a pair of Northern Lights auxiliary generators — a 20 kw and a 32 kw unit — to power onboard systems while under way. Abaft the engines is another generous space, allocated to crew quarters on the starboard side and a complete workshop and storage cabin to port. Two crewmembers can be accommodated with bunk berths, a complete galley and a full head with a shower. The proportions of this area would put the master quarters on many 40 foot motoryachts to shame. To allow its owners to partake of almost any pursuit under the sun, the Voyager has a large swim platform aft and a seating area at the bow. A covered California Deck, aft, is equipped with a grill, a wet bar and a refrigerator, and space for alfresco dining. If you're more formally inclined, multi-course gourmet delights can be concocted in the state-of-the-art galley amidships and served at the dining table in the forward lounge. The galley boasts an impressive array of tools, including a Thermador black ceramic halogen cooktop, a Thermador convection oven, a GE microwave oven, a Sub-Zero 20 cubic foot refrigerator, a Sub-Zero undercounter two-drawer freezer, an Asko dishwasher and a Broan trash compactor. The highlight of the saloon is a 42 inch plasma screen television, on the port side. The U-shaped seating area opposite it is a large and comfortable conversation pit, which provides a nearly 270 degree panoramic view through the windows surrounding it. On the third level, the 80 Voyager wheelhouse has a high-tech helm station — in a space that lets you show it off to everyone aboard. There are three swiveling captain's seats behind the controls, and a U-shaped seating area is immediately behind them. There's also a chart/computer station aft. Glass completely surrounds the bridge, providing a commanding view in all directions. Our test boat was outfitted with fully redundant electronic navigation systems, featuring Northstar chart plotting systems, Furuno radar and Raymarine and Icom communications gear. For docking, a hand-held propulsion controller can be taken out on the foredeck or sidedecks, where the skipper can get a better vantage point for close maneuvers. Of course, being able to maneuver with both a bow thruster and a stern thruster makes moving this 80 foot vessel a breeze. For stern-in docking, there's also a fixed remote helm station on the California Deck. The aft helm controls, bow thruster, stern thruster and hand-held throttle controls are all standard equipment on the Voyager. The third level — or boat deck, as it is appropriately named — provides space for water toys abaft the wheelhouse. This is one of several optional configurations you can choose from in the deck design. There's room for a seating area in the middle, or it can be taken by storage for personal watercraft, as it was on our test boat. The stern end of the deck has room abeam for up to a 20 foot tender — served by a 2,500-pound-capacity Nautical Structures davit. Both the tender of your choice and the davit come as standard equipment. 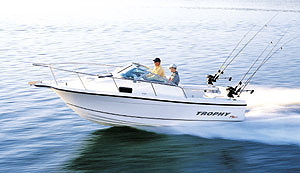 When it comes to mechanical systems on the 80 Voyager, chances are slim that a breakdown could ever spoil your time on the water. Along with duplication of all major navigation gear, you'll find two generators and two air-conditioning systems aboard. Each of the Marine Air 60,000 Btu systems is capable of maintaining interior climate control on its own. Earlier, we mentioned that because of its size, the 80 Voyager can cruise into places that a larger yacht cannot negotiate. 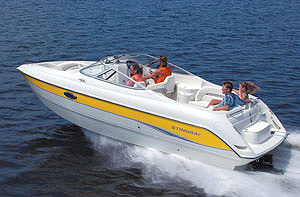 Once docked, it can be adequately served by a pair of 50 amp shore power connections. The electrical system was designed to be able to hook up in marinas where 100 amp service isn't available. The 80 Voyager offers an easy ride in sloppy seas, thanks in part to Wesmar stabilizers — a standard feature. With its 21 foot, 6 inch beam and a displacement of well over 150,000 pounds (when loaded), it will take any chop you might encounter in stride. 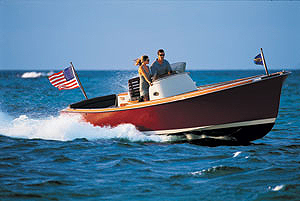 Naval architect William Crealock designed the semi-displacement hull to maintain a level running attitude at all speeds. 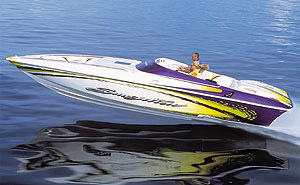 A soft entry minimizes pounding — even in head seas. Extensive tank testing prior to construction of the first hull assured that the hull would be seakindly. This large and lovely motoryacht can achieve a top speed of TK knots and cruises at TK knots, with its twin 800 hp diesels. An impressive 3,000 gallons of fuel capacity makes long-range cruising possible — and a full range of standard amenities makes an extended cruise an especially appealing idea. 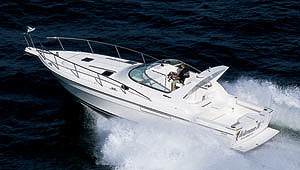 As its name implies, the Offshore Voyager 80 is definitely a great way to go places. 120,000 Btu chilled water air-conditioning units; 20 kw and 32 kw Northern Lights gensets; Wesmar dual-pump hydraulic system, including stabilizers, bow and stern thrusters, and dual bow windlasses; aft deck control station; hand-held remote engine and thruster control for bridge; two Glendinning Cablemasters; 2,500 pound Nautical Structures davit. 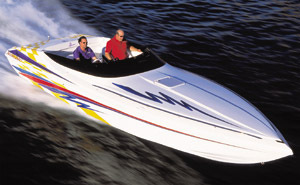 Hull extension with cockpit to 87 feet; engine options to 1,400 hp; electronics packages; dinghy. Hull is laminated and vacuum-infused fiberglass utilizing bidirectional and unidirectional Cotech and Knytex material, iso and vinylester resins; closed-cell sandwich construction above waterline; exterior hull finished with high-gloss off-white ISO/NPG Cook gelcoat; vinylester resin finish below waterline for maximum osmosis protection.